We examine an article of Paul Ricoeur on autonomy and vulnerability. Ricoeur presents the two notions in the field of justice as intricately woven into each other. He analyzes their interdependence on three levels of human agency. Ricoeur’s exposition has a focus on judicial judgment. 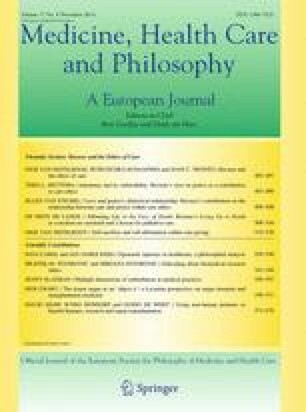 After presenting Ricoeur’s argument and an analysis of his main points, the author argues that Ricoeur’s reflection lines up with some essential intentions of care ethics. Ricoeur’s contribution to care ethics is given in a delicate balance of autonomy and its vulnerability. This article is dedicated to the memory of Prof. Dr. Han Adriaanse (1940–2012), emeritus professor in the philosophy of religion at Leiden University, who has introduced many students into the philosophy of his beloved Paul Ricoeur.